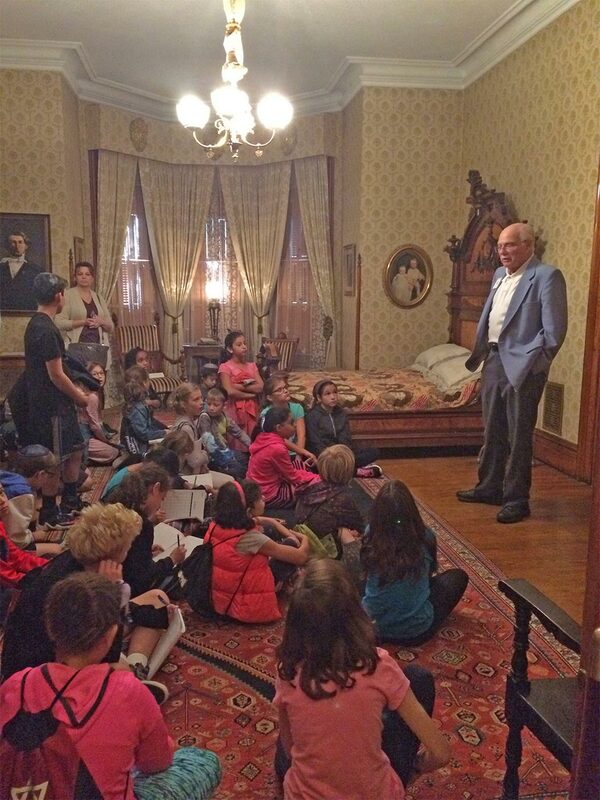 Students experience history firsthand when they visit the home of Indiana’s only U.S. president. Programs are designed to enrich curriculum and are available for all elementary grades. Tours are applicable to the Indiana State Curriculum Guide for Social Studies Standards. 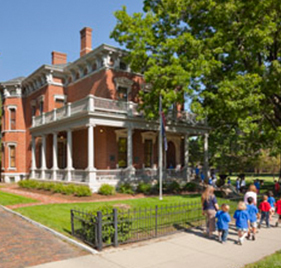 Trained docents guide students through the elegant home of Indiana’s only U.S. president. The dining room features presidential china, and Harrison’s study is filled with personal belongings from his White House years. The majority of the house furnishings, which give an accurate view of the Victorian era, are original to the Harrison family, including original wallpaper designs in the parlors and library. The third floor ballroom exhibit changes yearly. 3 sites. 31 standards. $0 cost to your school! You read that correctly! 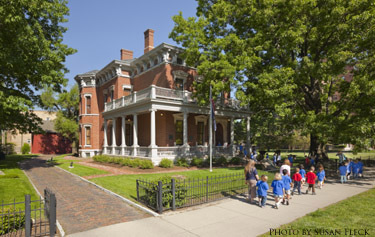 The Benjamin Harrison Presidential Site, the Indiana State Tour Office and Indiana State Library invite all 4th grade public school students in Marion and Delaware counties to experience all three sites in one day and achieve 31 unique state standards—FREE. Historical literacy of hallmark sites and significant people in our state are vital to our collective appreciation, education, and development of our children—the state’s future leaders. This program will consume the majority of the school day as it is designed to give a comprehensive look at all three historical sites. Students will have a 45-minute tour at each site. The Indiana State Library has space available to schools for lunch. Tours are available by appointment. Because there is the matter of coordination of calendars for the respective sites—please provide three (3) available dates (in order of your preference) when contacting us. If you have any concerns about the length of time you can be away from school, let us know as adjustments can be made to accommodate your needs. President and Mrs. Harrison welcome visitors to their home. They discuss their lives both as Indianapolis residents and as White House residents, while their staff shares family secrets with guests. This special program is offered four times a year: Presidents’ Day in February, Primary Day in May, Election Day in November, and a Saturday in mid-December featuring a Harrison Family Christmas. Check Events page for specific dates, times and costs. 5th grade 5.1.11 | 5.1.16 | 5.2.4 | 5.2.6 | 5.2.8 | 5.2.9. Call VP of Education, Roger Hardig at (317) 631-1888 weekdays between 9 a.m. and 5 p.m.
Teachers, bus drivers and one adult chaperone per 15 students are admitted free. 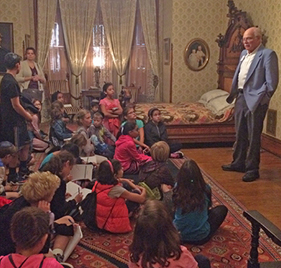 Each additional adult chaperone pays $8. Contact the Education Department for payment arrangements. Please note: The R.B. Annis Presidential Classroom accommodates up to 60 students. Larger groups at the same time on the same date must use the program and tour package ($6 per student) for a “flip-flop” in which half of the group tours while the other half has a program. A package visit lasts up to 2.5 hours. South lawn is available for picnics with prior notice (tables are limited and trash bags not provided). Gift Shop (Group Order Forms available). Special tours for sight and hearing impaired visitors. Online program materials upon request. Supplementary materials to teachers for tour and program preparation. Restroom Facilities: White building with brown trim is located behind the home and may be utilized before or after your visit. Please allow extra time for a restroom break. Additional charge of $20 per group for use of classroom for lunch (due to limited availability, advanced notice is required).